You may have heard the words Samsung C-Lab or Samsung Creative Lab bandied around. Like we all know what that is. It's always placed just before a pretty exciting jumble of words too so no wonder you're intrigued enough to want to read about it. Essentially Samsung has quit squeezing every feature and design detail under the sun into a handful of Big Deal Products and channeled some of this energy into low risk experiments. That is a very good thing. 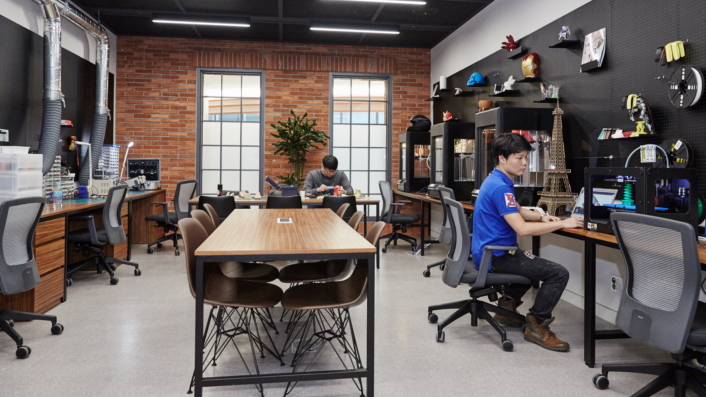 C-Lab is Samsung's crazy ideas factory, its budding startup maker or if you prefer business speak, an incubation program. Here's how it works. There are a whopping 163 teams under the Samsung C-Lab program with 20 teams working on VR and AR projects alone. As for other areas of focus, there's ten healthcare teams, six beauty and wellness teams, eight Internet of Things teams and 29 software, algorithm and services teams. C-Lab was started in 2012 and now has a physical location in the form of the C-Lab Space, unveiled last May. It is made up of the C-Lab Square for meetings and workshops and the C-Lab Factory which has tools like laser cutters and 3D printers. There's also an Idea Lounge with books and vending machines. It's all very Google and indeed there's something of the Mountain View philosophy at work here in allowing engineers time and resources to work on their own ideas. According to Samsung, the process goes like this: Idea discovery (contest, demo day, pitching day); concept development (team building, mentoring); prototyping (including feasibility tests); concept validation (at the C-Lab Fair and global tech shows) and then exit (either a spin-off or an in-house transfer within Samsung). The three real wearable tech success stories of Samsung C-Lab so far come from the first group to debut concepts at a trade show: Sgnl (formerly TipTalk) and Welt plus IOFIT from Salted Venture which followed the next month at MWC. Both Sgnl and Welt went to CES 2016 with their projects and both are in the production phases of successful crowdfunding campaigns. Sgnl is a $149 smartwatch strap that uses bone conduction to let you take calls by pressing your finger to your ear and works with regular watches and smartwatches. When we first demoed it, Innomdle Lab had already been spun off as its own four person startup led by inventor Hyunchul Choi, the first C-Lab project to do so. It managed to raise $1,149,202 on Kickstarter from over 8,000 backers (plus over 2,000 more from Indiegogo) later in 2016. Now, Sgnl was due to ship in February 2017 and it has been delayed six months signalling that C-Lab spin-offs suffer the same production challenges as any crowdfund success even though they are backed by Samsung. "Sgnl is under development. We had a issue on production so the delivery date is postponed until August 2017," planning & marketing manager Saemi Kim told us. The Innomdle Lab team posts regular production updates and it had a busy year all round including showing off a new, minimalist design at this year's CES: "The year 2016 was a year of big meaning to Innomdle Lab. We introduced Sgnl for the first time with a Kickstarter campaign, expanded to be a crew of 11 members, and every day was a day of blessing thanks to all backers rooting us on. We will give our all to present the best Sgnl in 2017." Welt's story is much the same though on a smaller scale. The smart health and waist tracking belt began life as a C-Lab project by an ex-doctor at Samsung in November 2014 before a collaboration with Samsung Fashion in October 2015. The Kickstarter campaign last year, after its CES debut and a lot of press coverage, raised $72,000 from 620 backers. Manufacturing is in progress though, again, Welt hasn't managed to hit its January 2017 deadline for shipping. And back in October, co-founder Ken Woh told us: "We're hiding some features for a future firmware update. So when the users get our product they will be able to enjoy more features in the future." As for Salted Venture, it raised just over $100,000 from 449 backers on Kickstarter last summer for its IOFIT golf shoes. The shoes, which are packed with sensors and aim to improve golfer's balance and weight shift in real time, are another C-Lab campaign that's running slightly late on its February 2017 deadline but they are now in production. The team of 12 engineers, designers and marketers is headed up by CEO Jacob Cho. IOFIT's marketing director Jungsoo Park told us that the shoes will ship in May or "June at the latest". Since then, Samsung C-Lab has brought a gang of projects to CES, MWC, IFA and SXSW, and there's always a wearable tech, VR or connected health element on show. So at this year's CES, we saw the skincare scanner Lumina and at MWC three Gear VR apps joined the Monitorless AR & VR glasses. "We are a team of five engineers and we have been working on the hardware prototype and software since last October, so six months," the Monitorless team told me at MWC. "We are going to continue to develop it, make it slimmer and smaller. We are pursuing a sunglasses type of design AR device and this project will also be available for the Samsung Gear VR." These kinds of outings represent that 'concept validation' stage of the C-Lab acceleration process. But just because a product gets a enthusiastic reception doesn't mean it will hit Kickstarter within six months. Remember Rink? Those handheld motion controllers for the Gear VR that we played with alongside Sgnl and Welt at CES 2016? Well, the internet went pretty nuts for them and I must say I joined it, thoroughly enjoying my time spent pretending to be Iron Man in mobile VR. We thought they might be dead in the water when we saw Samsung's new handheld controller at MWC that's more like a Daydream pointer than a strap your wrists in design. But don't worry - Rink is still listed on the C-Lab literature as an "interesting C-Lab project". We've contacted senior engineer Yongjin Cho who created the controllers to ask about progress and we'll update this if we hear back from him. As for what's next, the C-Lab concepts get more and more futuristic, particularly when it comes to interaction tech. Entrim 4D still lives on as a C-Lab project that is being promoted - that's the headphones that help you to 'feel' VR via galvanic vestibular stimulation which we tried at last year's SXSW. As for what we might see demoed at this year's Austin tech fest, Gaze-It is a hands-free VR interface that uses electro oculuography to track your gaze and recognise words based on your lip movements. Very cool. And T.O.B, which stands for Touch On The Brain, is a headband that is apparently capable of generating the sensation of heat and touch via a 'harmless' acoustic impulse which stimulates 'certain brain spots' to match VR games and movies. In other words, C-Lab has gone full Brave New World Feelies and we can't wait to try those two out. Along with every other C-Lab project because let's face it, even when the concepts aren't quite there, we've seen very few duds in amongst the gems. MWC 2017: Would you wear these specs in your home office? "Hey Mum, I'm in Zurich!"